Destiny 2 Forsaken is almost here, and it seems even the most hardened Guardian can't help but be intrigued (and a little excited, let's face it) by Bungie's all-new game mode, Gambit. Offering a blend of both players versus player (PvP) and player versus enemy (PvE) gameplay, Gambit splits eight people into two four-Guardian teams, pitting you against each other as you protect your arena from AI enemies. As the enemies attack in waves - kind of like a traditional horde mode, getting harder and tougher as the round progresses - you must defeat the masses and collect "motes", which is Gambit's currency. Like some of the items collected via Destiny patrol missions, these items will fall when enemies die, so the quicker you despatch of the baddies, the better. As you might expect, the bigger and tougher the enemy, the more motes will fall. You can only carry 15 at a time, though - and your bank will wipe if you die - so it's best to bank your motes as often as possible. Collect and bank enough motes - especially in groups of 5, 10 or 15 at a single time - and you'll deploy a Blocker to attack the other team, preventing them from gathering motes until the powerful enemy is destroyed. This'll give your team a competitive edge as you can keep gathering the motes whilst they're preoccupied with the Blocker. That's not all, of course. Eventually you'll bank enough (75 motes) to draw an enemy to your own side: the Primeval. Any team deaths will auto-regen the Primeval's death, so it's vital to keep your teammates alive and kicking. Defeat that, and the round is yours. The first team to complete two rounds wins the match. Oh, and just to keep you on your toes, each team can periodically invade each other's areas, too! Collect 25 motes - or the other team summons a Primeval - and a portal will open, giving your team access to the enemy arena. Most interestingly of all, unlike the Vault of Glass raid where the game dictates who gets sucked into the portal, you can choose this time, sending in the best Guardians for the job. Pro tip: apparently, your screen-name will indicate how many motes you're carrying, so if a sniper from the other team pops up in your camp, they'll know who all the High-Value Targets are… so bank often if you don't want to lose your stash. Unlike Trials of the Nine, Destiny 2's elite PvP mode, Gambit will offer matchmaking, so you can jump in regardless of whether or not your pals are online. And with four brand new maps and three different types of enemies available on each one - and three variations of those possible - Bungie reckons there's enough variety to keep the combat fresh. 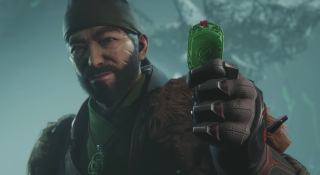 With the introduction of The Drifter - the Gambit's own vendor - we're expecting a heap of new collectables, too including its own gear, Infamy reputation, and bounties. Destiny 2 Forsaken releases on September 4, 2018, for PC, PlayStation 4, and Xbox One.